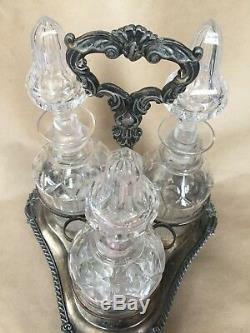 This is a very stylish circa 1880 Victorian Silver Plate Tantalus with the three original Blown and Cut Glass Liquor Decanters. 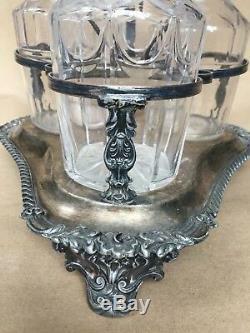 This Tantalus Set is a very fine quality example with beautiful Victorian Period Cast and Repousse designs throughout, with ornate handle and feet. 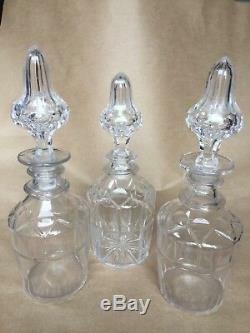 The Decanters are hand blown and featuring nice cut designs as seen. This came from a very old, extravagant estate. The Tantalus displays nicely, but needs a polishing with slight silver wear throughout. 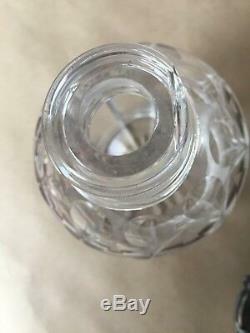 The bottles are very clean and the stoppers are gorgeous, hollow, and fit well. The set would look incredible polished. 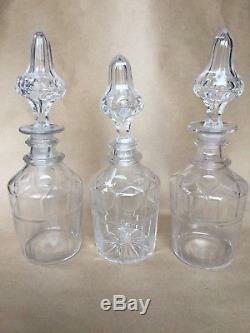 The bottles may not be a matched set--only two have the same style of bottom and cut pattern: a pair measuring 6 1/2" high with a large pontil, while the the other measures 5 1/2" with a star cut bottom, but the stoppers seem to be a set. The smaller decanter has been repaired, possibly due to a break, professionally, to a smooth finish, (please see photo, this is very smooth, not sharp) and this does not detract from the beauty of the trio. Please ask questions, thanks for looking. 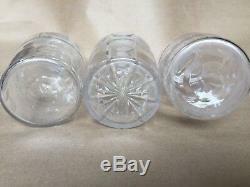 The set measures approximately 13 high with bottles. 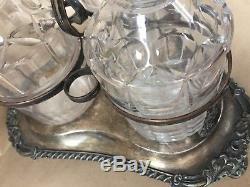 The item "LARGE c1880 VICTORIAN SILVER PLATE & CUT BLOWN GLASS LIQUOR BOTTLES TANTALUS SET" is in sale since Sunday, January 27, 2019. 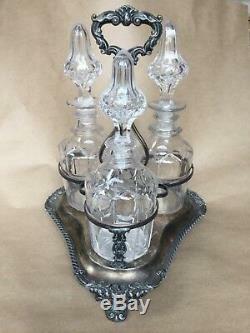 This item is in the category "Antiques\Silver\Silverplate\Bottles, Decanters & Flasks". The seller is "pinkpajamas" and is located in Chicago, Illinois.